A man with Alzheimers wanders away from home. A child is missing, or a hiker becomes hopelessly lost in the mountains. It’s drizzling rain, you’ve been walking for hours only to find that you’re right back at that same fallen tree again. It’s getting late, you’re getting cold, and the last bit of water in your bottle is almost gone. A K9 Search and Rescue Team could be the best solution in your situation. What’s it take to be on a Search and Rescue Team? Walk with me, and I will take you on the information journey to becoming a part of a very special group of individuals. We do this, after all “...So Others May Live”. Do I need a dog to be part of a search team? What Certifications or Training do I need? As you can see, there are a lot of things to think about before you can decide if this job is right for you. Having good information is the place to start, and you’ve definitely found that place! Already a SAR team member? Find a wealth of information on training and education, certifications, or other SAR organizations. Feel free to explore this site, and discover the unique content hidden inside. Actually, you won’t be needing your compass and grid reader here. All roads...lead home. 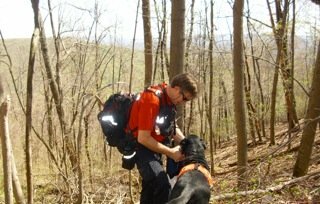 One SAR dog can accomplish the work of 20-30 human searchers! A Dog’s nose is about 40 times more sensitive than a human nose. Dogs can see 4 times better at night than humans! It takes about 800 hours of training for a dog to become field ready. Nearly 137 SAR Missions happen each day, that’s about 6 missions per hour! Over 90% of SAR missions are performed by volunteers.